Alice Carpenter can see and talk to the dead. She’s perhaps a less intense version of the Ghost Whisperer. She’s pretty and mostly likeable and clearly the star of the show. Her cousin, by contrast, is dull and straight-laced. Katy is no less fleshed out but just not as interesting as the only woman to solve a two-hunderd-year-old murder case. Sir Gary Gavin believes that the end to his two-hundred-year stay on the mortal plane is to expose his murderer. How does someone go back into history to allow a tortured and troublesome soul to move on? Complicating matters is Bucky, a newly dead boy looking for his head. Alice (and probably Simmons given the detail) is a woman that loves her furbabies and what they’re up to is a constant thread in the story that leads it to drag a bit. Each scene tracks the Rottweiler and Siamese cat. The story starts rather quickly, slows considerably once Bucky appears in spirit form and then things drag. We skip through the setting getting elaborate descriptions of what people are wearing and what is in a room and always we must track the pets. OK, don’t get me wrong, in my adult life I’ve always owned a dog. My current Puggle is the best boy in the world, but there are points where the reader just begs to get on with the story. Bucky causes problems, Sir Gary causes problems, Katy simpers is a predictably boring and somewhat helpless way. The ending was a bit predictable but not outside of the realm of what one would expect from a cozy paranormal mystery. Something I found interesting in Dead Man Talking was that there are certainly prequels coming down the line. Dead Man Talking did not read like the first novel in a series. There is clearly a backstory to which the author alludes but the audience is not privy. That said, I’m not sure that this particular story lured me in so that I’d seek out those novels. So is Dead Man Talking a book you should watch out for and read on a cool afternoon approaching Halloween? Not really. It’s interesting that the story is something you’ve likely not seen before but, though well written, it is really not that compelling. 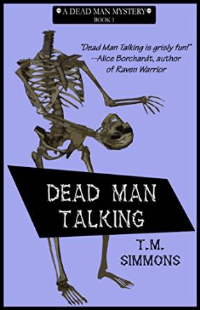 If you love paranormal and like a wide array of ghosts with a variety of issues, give Dead Man Talking a shot. or more information about T.M. Simmons and her work, visit her website. and her blog I See Dead Folks. You can connect with her on Goodreads, Facebook and Twitter @TMSimmonsauthor.